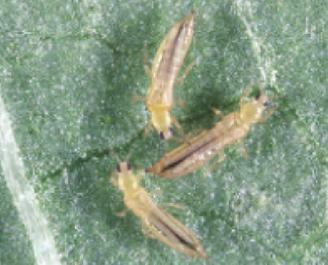 Various species of thrips (larvae and adults) especially Western Flower Thrips. 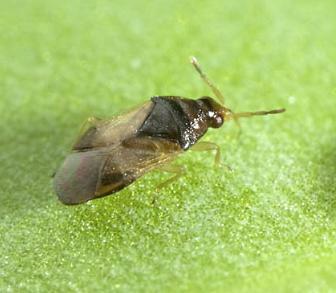 In the absence of thrips Orius can also survive on aphids, spider mite, butterfly eggs and pollen. World wide, Orius is used to control thrips in Capsicum (sweet pepper) crops, also strawberries, gerberas and eggplant are also suitable. Crops that produce flowers with pollen and that are not immediately harvested are best suited for Orius use. Roses for example where the heads open and are cut regularly are not recommended. Orius has 7 developmental stages: egg, five larval (=nymphal) stages, and adult. The female lays its eggs in the plant tissue of the stem, fruit, petiole, and major veins on the underside of the leaves. The egg is almost completely embedded within the plant's tissue with only the cap-like upper part visible, which makes monitoring difficult without the use of a hand lens. The development time of Orius from egg to adult is about 16-18 days at 25°C. The adult lives for 3-4 weeks, the male having a shorter lifespan than the female. In all its developmental stages, Orius is able to hunt and kill its prey by sucking its body fluids. 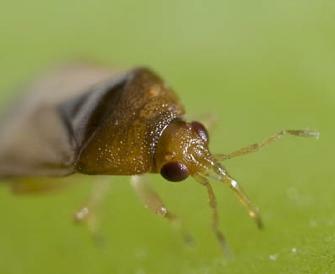 At a temperature of 20°C, Orius can kill about 2 western flower thrips a day, and when the pest population is high, the Orius will kill more thrips than is required for its nutritional needs. Adult Orius has good flying capabilities and quick movement, which help considerably in finding new prey and in dispersing within the habitat. Each bottle contains 500ml of vermiculite and 1000 Orius. Gently rotate the bottle several times to evenly mix the contents. Sprinkle 10ml on top of plant heads near the flowers. Try to ensure most of the vermiculite stays on the top leaves without too much falling through. Each bottle should give you 50 release points covering an area of 500m2 with each release point receiving approximately 20 Orius. Endeavour to release in lower light conditions e.g. (early morning/late afternoon) as the Orius will settle in the crop much better than in full sunlight. 3rd release 2 weeks later at 2-3 Orius/ m2. A total of 7 Orius/m2 should be released for high thrips presence, and 4-5/ m2 for lower thrips presence. As the season progresses further releases may be needed into thrips hotspots which occur in areas near doors, open vents, or next to neighbouring farms with high thrips infestations. Orius is light sensitive, therefore during the cooler darker periods of the day Orius will hide more in leaf tips and stems. Orius are more active in the middle of the day as indicated by the red staining that the Orius secrets onto the white petals of capsicum flowers when feeding in the flower. Once the Orius has been released for 3-5 weeks, juvenile Orius will appear and will have a red dot on their backs during the early stages of their growth.